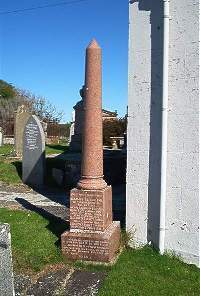 Benjamin Sutherland of Tormore Dunbeath elder of the Church of Scotland born 30th January 1807 died 1st April 1868. Daughter Elizabeth died 2nd January 1839 in infancy. Son Christina born 23rd September 1849 died 5th December 1851. Under him that loved us and washed us from our sins in his own blood and hath made us Kings and priests unto God and his father to him be glory and dominion for ever and ever amen. Wife Christina Gunn born 24th July 1811 died 2nd Febuary 1901.